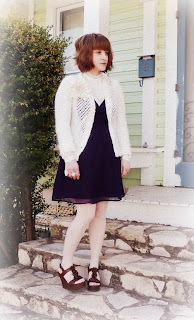 Lemondrop Marie is coordinating an internet clothing swap for fashion/style bloggers. I love her style, so I am ready to take any of her clothing cast-offs, and you can too. Are you interested in bringing something new (to you) to your closet in exchange for something you've lost the thrill for? If so please checkout the SWAP STOP blog. Why should you join us at Swap Stop? Recycling fashion, you are a green shopper! Visit the blog, think about something you would swap and check out what other bloggers are willing to give up! Link up! Invite some friends of yours that you'd think would be interested- the more, the swappy-er! 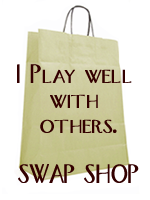 Visit the Swap Shop blog if you wanna play! I would love nothing better, but Will the swap with me in Spain?????????????? I have to check my closet to see if there is anything swap-worthy. What a great idea. Happy weekend, honeybug! Sounds fun! But is it round-the-world??? Bella, this is great and very conscious idea! I'll be checking her blog later on. All the clothes that I don't wear anymore are recycle to my friends, my daughters and my church. I like this! I will participate, thanks Bella! I love this idea! I just may have to check this out. This is a great idea! I'm lucky enough to have The Swapaholics based here, so I have a live swap to go to next week. Otherwise, I would definitely participate in an online swap. I saw this before and I forgot about it. I also love the flickr fashion swap group. I just wish more people were active in it. so excited about this--gonna dig through my closet right now! that's such a cute idea. and i love the name of it too! That looks like so much fun. Unfortunately, I'm super lazy. I'd rather just give it all to the goodwill or a neighbor. (Actually, I do that a lot) but it would be fun to try. Love this idea, especially for us second-hand pledgers. A similar thing is going on in Toronto called Uber-Swap but it is in person where you bring a bag of gently-used goodies, pay $5 to get (which all goes to aid Japan) and then take what you like. Amazing!